They were married on the Brooklyn Bridge in New York City. 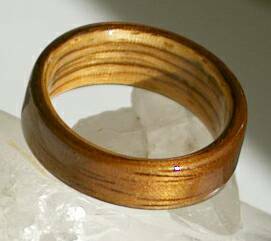 This was Joel's wedding ring; a slightly tapered Koa Wood Ring with an interior liner of Zebra wood. Sallie's ring was the smaller inset pic to the left - made of koa wood with a juniper lining.